We’ve got super fudgy White Chocolate Brownies on the menu today. 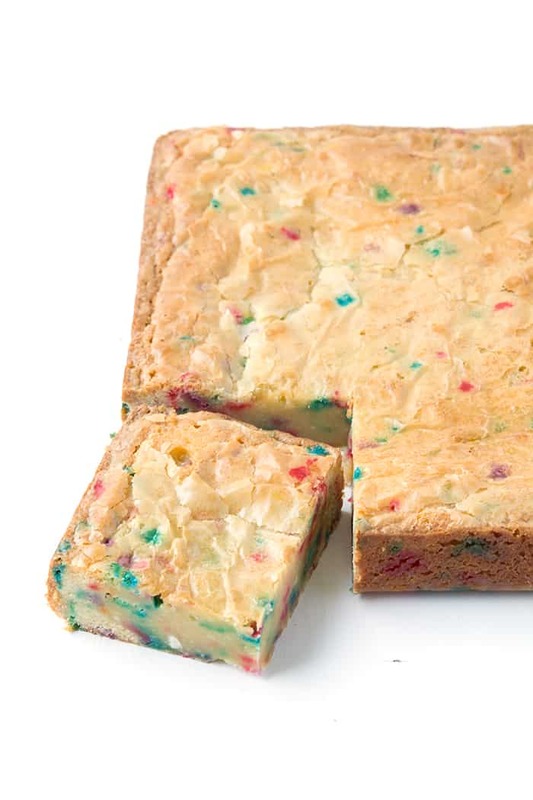 One bowl brownies made with real white chocolate and loaded with chocolate chunks and colourful funfetti sprinkles. You don’t need a mixer, just a bowl and a whisk and you are all set. If you love white chocolate, you will LOVE these! Ever since I made my White Chocolate Coconut Brownies, I have been on a brownie kick. I love them in all shapes and sizes, from extra chewy ones loaded with Snickers (HERE) to the more cakey kind made just with cocoa powder (HERE). But my latest obsession is white chocolate brownies. As you would imagine, they are quite sweet but they have the most amazing buttery texture . And a little pop of colour, thanks to the sprinkles. They are deliciously fun and (even better), delicious easy. 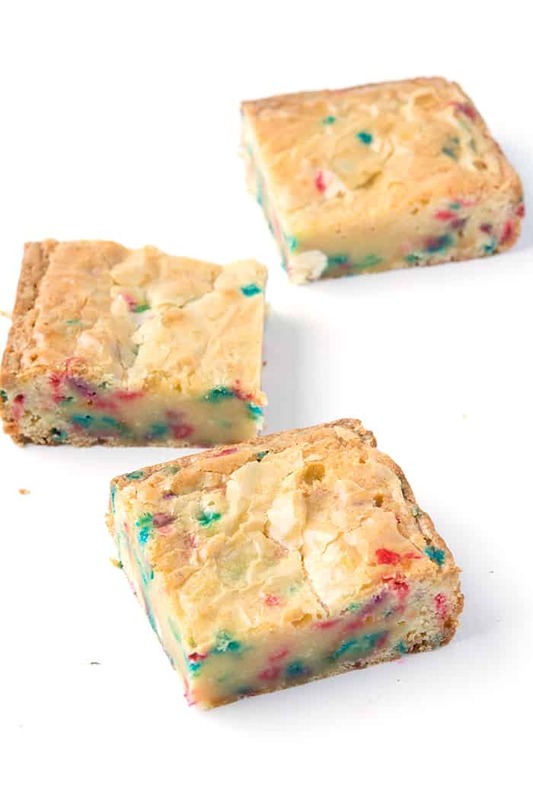 To make these White Chocolate Brownies, all you need to do is melt some butter and white chocolate. Add some sugar, vanilla and a couple of eggs. Whisk together, than add some flour. The final touch is a few extra chunks of white chocolate and some funfetti sprinkles. 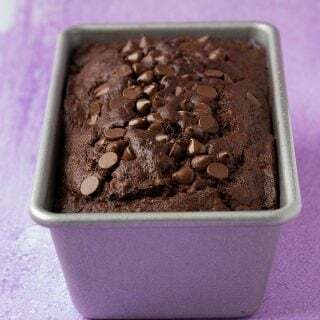 Bake the brownie batter for about 30 minutes or until golden brown and you are done! You can munch on these once they are cooled, OR you can pop them in the fridge for a few hours. 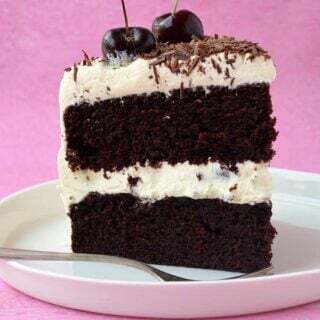 That way, they go extra fudgy – YUM! Even though they are made with white chocolate, these gorgeous brownies still have that all important crinkly brownie top and crispy, chewy edges. I made and ate more than my fair share of these brownies, so I shared some with my work colleagues – they also gave them the thumbs up! So if you’re on the hunt for easy One Bowl White Chocolate Brownies, l’ve got you covered. 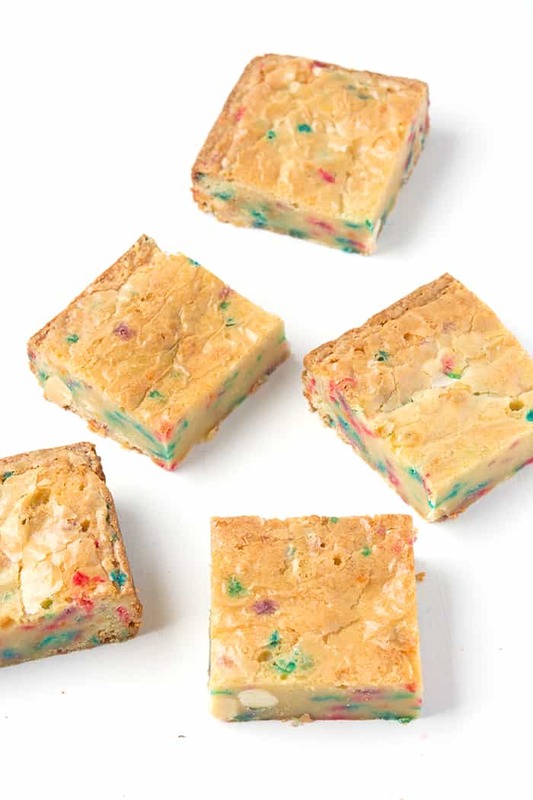 One bowl brownies made with real white chocolate and loaded with chocolate chunks and colourful funfetti sprinkles. 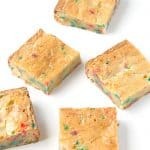 Grease and line a square 8 inch cake tin with baking or parchment paper, ensuring two sides of the paper overhang. Preheat the oven to 160 C (320 F). In a large bowl, add 150 grams (1 cup) white chocolate and butter and pop in the microwave, stirring every 20 seconds, until completely melted. Next, add the sugars and vanilla and stir until combined. Add the eggs, one at a time and mix again. Then add the flour and salt and mix until smooth. 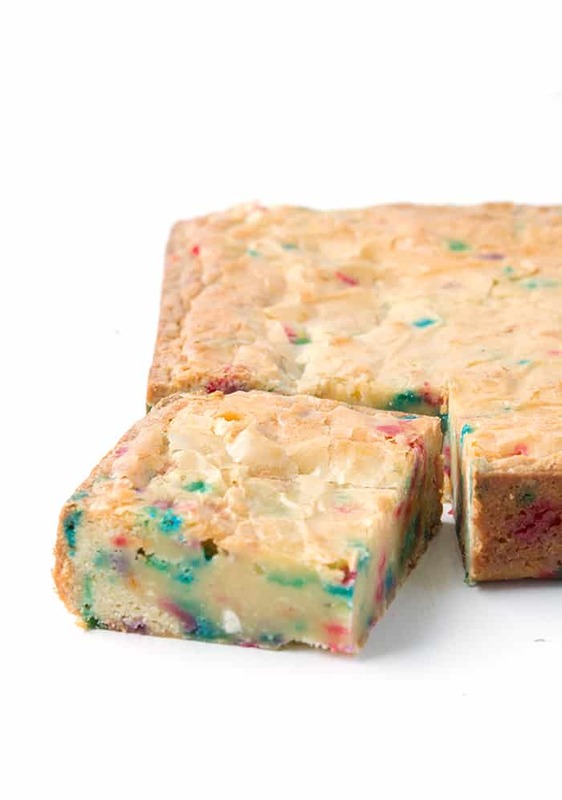 Roughly chop the remaining 50 grams (1/3 cup) white chocolate and stir into the brownie batter, along with the sprinkles. Pour brownie batter into prepared pan and smooth the top. Bake brownies for about 30 minutes or until cooked through. Insert a skewer into the middle to see if comes out clean, or remove once the edges of the brownies are golden brown. Leave to cool completely before serving. 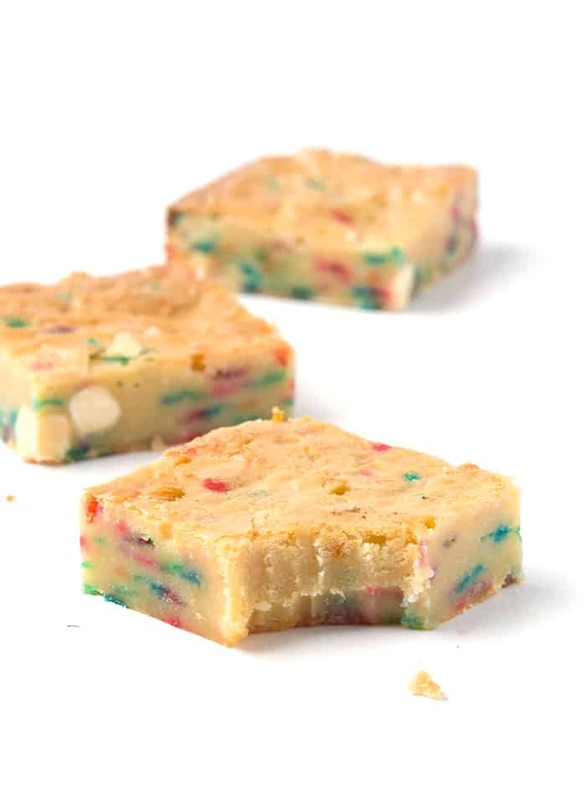 PS your instructions stated more white chocolate chopped up but in the ingredient list it only says 1 cup…which is melted at the beginning…I just added more at my best guess. These look promising!! Thanks for the recipe!!! Hi Sarah! Ooh good pick up, sorry about that. I’ll fix it now but what you did was correct ☺️ Thank you for trying one of my recipes! 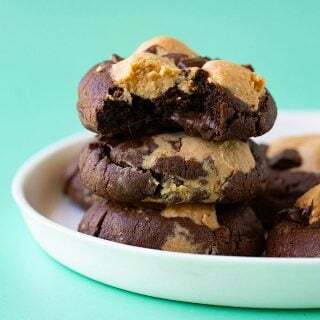 These look SERIOUSLY fudgy! I love anything with sprinkles so funfetti anything is a hit with me! Me too Kristy, bring on the sprinkles! These are soooo right up my alley and the photos are gorgeous!! I love these Jess! 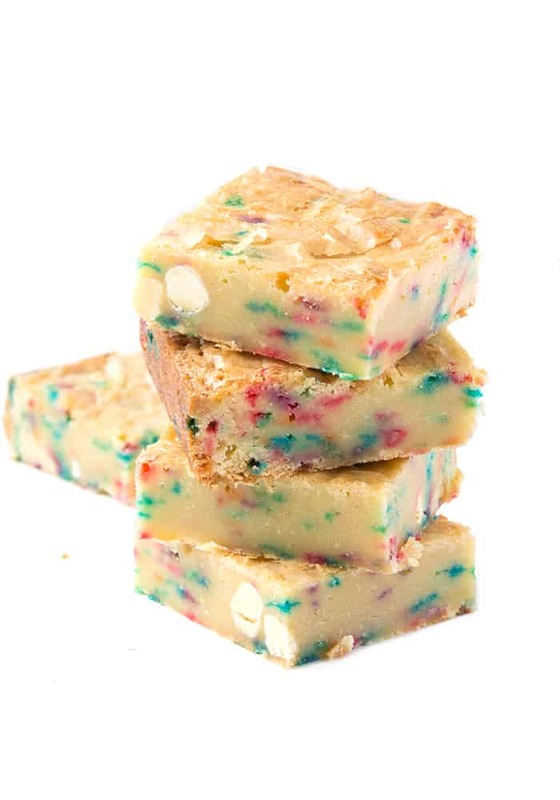 The splash of sprinkles throughout the white chocolate looks so cool and the fudge factor is perfect! Thanks Emma! I love a good fudgy brownie!